Patient compliance is essential to the success of a clinical trial, but because asthma patients experience symptoms at irregular intervals throughout their day, study sponsors find it extra challenging to capture clean, accurate and representative clinical outcome assessment data. 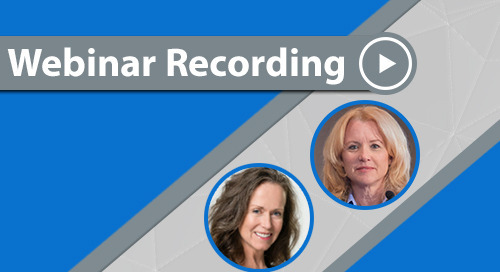 Watch this on-demand webinar to learn how the most successful asthma trials are leveraging electronic Clinical Outcome Assessment technology (eCOA) to seamlessly blend with the patient's daily routine to dramatically increase compliance. The key challenges that impact all stakeholders in asthma trials: sponsors, sites and patients—and how eCOA can solve these problems. 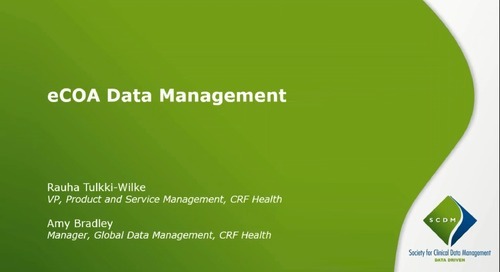 How to best analyze patient data to refine solutions based on their preferences and routines for a more effective data capture experience. 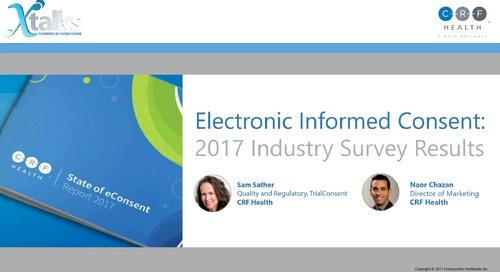 How PEF Meter integration can increase trial compliance and data accuracy. Good morning and good afternoon, and potentially good evening for everyone that’s joining us today on the line. We do appreciate it, despite all the busy-ness that the holidays bring. 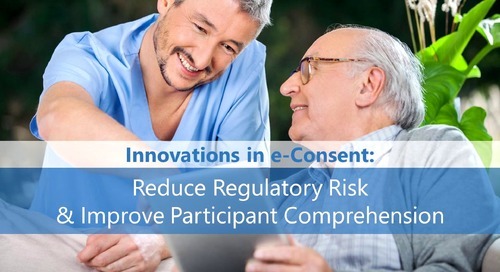 Today’s CRF Health webinar is entitled A Breath of Fresh Air and how eCOA technology integration can help boost patient compliance, specifically in asthma trials. Our presenter today is the lovely Jessica Thilaganathan, who is a Therapeutic Areas Coordinator out of our London office of CRF Health. And Jessica is primarily responsible for supporting and coordinating the development of our products and services and ensuring that they meet the high-quality eCOA clinical trials in all therapeutic areas and indications. And of course she’s super-passionate about creating solutions that fit into those patients’ lives and behaviors. She has a master’s degree in medical chemistry from the University of Leeds, for some background. And with that, I will pass it along to Jessica. Please take it away. Thanks Naor, and thank you everyone for joining. As Naor mentioned, December is really busy, so we’re grateful that you could fit us in before your Christmas break. 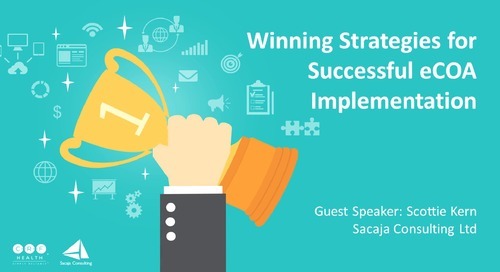 In this presentation, I’m going to discuss some of the common study challenges that have been observed in asthma clinical trials and talk about how electronic clinical outcome assessments can be used to help solve them. 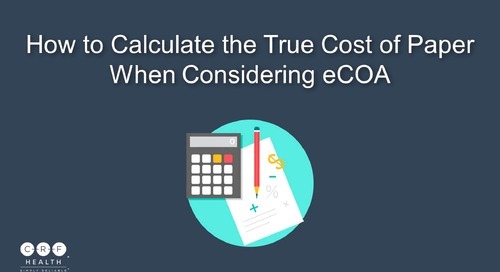 So for those of you who may be less familiar with eCOA, I’ll begin with an introduction to clinical outcome assessments and then talk about what the “e” in eCOA means, before we divide into why they’re so important to be used in asthma clinical trials and what challenges they’re going to help solve. 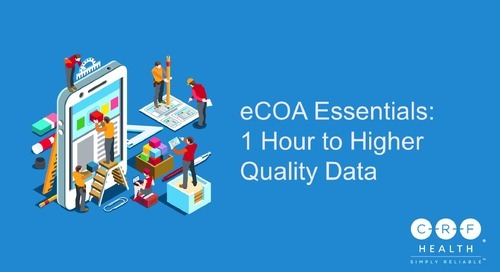 We’ll then look at patterns that we’ve observed when analyzing patient data from existing trials using eCOA for asthma and discuss how eCOA can be used to solve typical study challenges. So a very brief agenda. These are the three takeaways: what is eCOA—which may be familiar to some of you on the call—why are the asthma studies so challenging, and how can we support those challenges using eCOA. So a very brief introduction to clinical outcome assessments. As defined by the FDA, a clinical outcome assessment is any assessment that may be influenced by human choices, judgment, or motivation. And that may support either direct or indirect evidence of treatment benefits. So unlike things like biomarkers that rely completely on an automated process or an algorithm, clinical outcome assessments depend on the implementation, interpretation, and reporting from a patient, a clinician, or an observer. And there are four main types of clinical outcome assessments. So the first is a patient-reported outcome, which is any report of the status of a patient’s health condition that comes directly from the patient themselves. So without any interpretation or anyone else’s influence, and it’s not the response by a clinician. So then we have clinician-reported outcomes, so that’s an assessment that’s determined by an observer with some recognized professional training that is relevant to the measure being made. So often the patient’s doctor or an independent rater with that medical background. And then we have, third, is an observer-reported outcome, which is an assessment that is determined by an observer who doesn’t have a background or professional training that is relevant to the measure being made. So that is often like a caregiver or a family member who knows more about the patient but not necessarily has a background in the conditions that they’re experiencing. The fourth type is performance-related outcome measures, the performance outcome measures. And we don’t see them as typically used in clinical trials, but that may change in the near future. 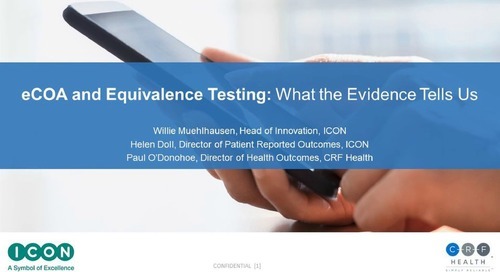 So what is an electronic clinical outcome assessment? As I’m sure is quite apparent from the name, it just means having these clinical outcome assessments administered electronically rather than on a traditional paper-based platform. 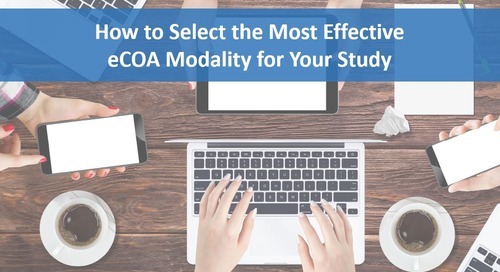 So as you can see from this slide, we have a number of different possible modalities that we can use when we talk about eCOA. We have the touch, which is like an eDiary, a small device. We can use the web, which is a form of BYOD. We have a TrialMax slate here, which is usually used in sites, a reporting platform where everyone can log in to see patient data. And it’s also the IVRS and the ePen. So there’s a number of different modalities that could be used. Before we go on, I just want to do a quick poll to gauge how the audience is feeling about eCOA on the call. So just a quick question today: have you used eCOA in any asthma trials. If you have, then that’s great, click yes. If you’re thinking about it or if you haven’t done it before, we’d also love to hear what position you’re in at the moment. So the majority of people on the call have used eCOA in their asthma trials already. That’s great to hear, and we’d love to hear about some of your experiences maybe in the questions and answers, if there is anything you feel you have experience with that we didn’t cover in the webinar we’d love to talk about that. For those of you who haven’t considered it, hopefully, we can change your mind by the end of the presentation, and definitely, those of you who are on the fence, hopefully we can explain the benefits of eCOA in this therapeutic area. So when we talk about clinical outcome assessments, we mentioned there were three types. We often find that PROs—and more and more this is kind of what the regulators are saying—is that PROs are the best way to go because, when it comes to really knowing a condition, patients are the expert in their disease and how effective their treatment may be, even though historically symptoms are often reported by clinicians. When it comes to ClinROs, for example, that’s a good form of collecting data, but it’s still the clinician’s opinion rather than the patient’s themselves. So we found that ClinROs are a good form, PROs are an even better form, and ePRO is the best way to collect data for your clinical trial. So when it comes to asthma clinical trials, I have this map here that shows the prevalence of asthma. Over the past ten years the prevalence has risen by over 50%, quite a large number with there being over 235 million people suffering with the condition. That equates to around one in ten children and one in twenty adults. And managing their condition can be quite a burden to these patients. They have to track things like their peak expiratory flow rates, and their forced expiratory volume values. And those are largely what the common key endpoints in asthma clinical trials. It’s interesting that as we’ve seen asthma clinical trials become more frequent, we’ve also seen quite a high adoption with eCOA. In terms of therapeutic areas, we feel like this one has one of the highest adoptions because there’s lots of benefits, which we’ll discuss later. So now, to the key study challenges that have been observed. So what are the challenges that we feel eCOA can help solve in asthma clinical trials? Well, our top five challenges that we’re going to discuss in this webinar are: difficulty actually collecting symptom data, this is getting really clean physiological data, so the PEF and SEB 1 values. Poor patient compliance and that’s kind of followed on by high patient burden, the two are very interlinked. And difficulties managing patients in between site visits. So those are the kind of things we’re going to break down in greater detail and talk about how we can help solve them. 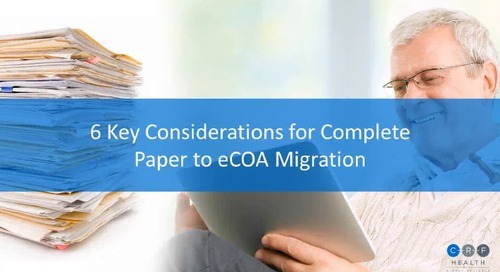 So first, for those of you who have, or haven’t, or are considering eCOA, what are the kind of key challenges that you think you’re facing. 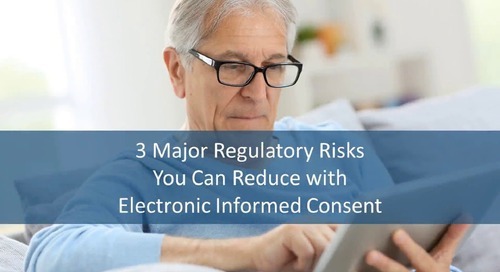 Have you not used eCOA because of a lack of knowledge, or other kind of things you’re worried about—poor patient recruitment or issues of compliance or maybe that having these devices would add burden to the patients. 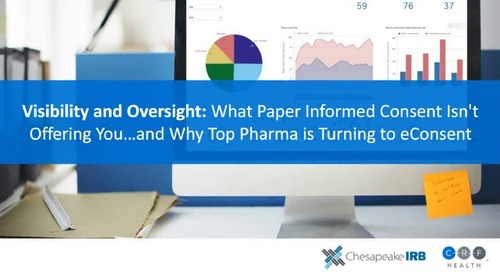 So high patient burden is the biggest challenge that we described here, so that’s good to know, we can focus on that more as we go through the presentation of how can we reduce patient burden and increase patient compliance by using eCOA. So I’m going to present about some of the data that we’ve analyzed in eCOA studies that have shown different patient routine and preferences. But before I present our figures about what compliance we’ve seen with eCOA, I’d be really interested to see if you have been tracking compliance in your paper studies, what compliance you have observed or achieved in your studies. So if anyone has done a paper asthma study, and you did track compliance, could you pick which region reflected your study results. And seeing in the chat that some people haven’t been tracking that, that’s quite common. 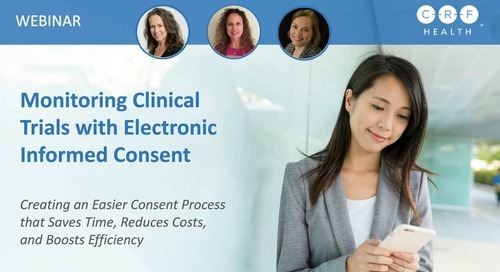 And one of the reasons that it’s good to go electronic is that it’s much easier to track patient compliance. So a lot of people haven’t been tracking their compliance in their paper studies, but we have see, for those of you who have, that the 20-40% kind of category is your most common. So it’s pretty low. So now I’m going to share with you the compliance that we’ve seen in a couple of global studies that have used eCOA. So these graphs show morning and evening compliance for four different global studies. As you can see, we’re very much in the 80-90+ region. It’s interesting to see that morning and evening diary compliance can slightly vary. Sometimes we have a bit lower in the morning—maybe it’s a bit harder for patients to fit it into their daily routine. But generally as a whole, compliance is exceptionally high when using the eDiary. And we’ll talk through some of the reasons for that when we talk about how we can confront things like low patient burden. Another concern that we get a lot of the time is the fact that everyone can be concerned by patients having to carry around two devices. So often in asthma clinical trials, we’ll give them an eDiary and a PEF meter to take around so that they can take their measurements and sign them and report their symptoms in the diary. I think this is an interesting one, because as technology expands, I think myself, I have far more than one device I take around, and I’m sure that’s true for many people on the call. So I think it’s something that people get used to. But we did do some analysis into how compliant patients were with using both the eDiary and the PEF meter. A lot of people had concerns that they might just take the PEF meter around and do their readings and not fill in the eDiary. So we did have concerns about people carrying around two devices, but in lots of studies that we’ve analyzed, we’ve seen that actually, patients are 95% compliant with both devices. So the way that the eDiary works, when they complete their symptom data or their questionnaires on the diary and then take their PEF readings, they’re 95% compliant with doing both at the same time. 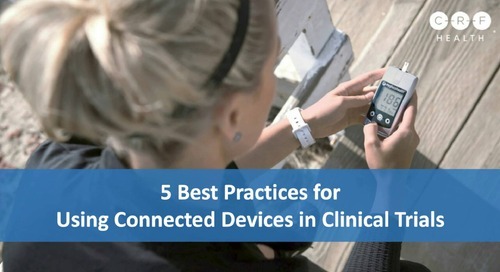 So we are finding that patients are in fact taking both devices around and that it’s not an issue for them. I think one thing that’s really interesting to look into is what time of day do patients report. Statistically, in asthma studies, we ask patients to fill in their diaries both in the morning and in the evening, because that diurnal variation in symptoms is very important. So we want to make sure that they’re not filling in data outside of those windows retrospectively or trying to fill it in days later. So in order to really fit into their lives, it’s important to analyze when it is that they tend to report. So we’ve analyzed a couple of studies and we’ve seen that between 10-11 am seems to be the key time that patients are reporting their morning symptoms. That should be really fed into the diary design, so we can use that to adapt our eCOA solutions and make sure that we time our alarms and our reminders so that we give an alarm outside, just after 11 am so that if they’ve not reported in their normal window, it’s just a little reminder to say, don’t forget to fill in your morning diary today. Similarly, we can make sure that with very little people actually filling in the diary as early as 8, that we’re not intrusive in putting hourly alarms from 8:00 saying please fill in this diary, because that will add to the burden and turn patients off from being compliant with the diary. We also looked at the routines in the evening, and similarly, there is a clear winner, between 9-10 pm is the key time that patients are reporting their evening diaries. And that will also help to tailor those evening alarms and help patients remember when they should be filling in. I think it’s interesting that as little as 3% of people are completing their diary between 7 and 8 pm. I think that this shows that we can’t expect them to be doing everything as soon as the questionnaire becomes available or as soon as the diary becomes available. We need to think about what routines they may have and how we can feed that into the design to further reduce the burden and improve the compliance. So now we’ve thought about the patient preferences we’re going to delve further into those study challenges. So the first study challenge I mentioned earlier was difficulty accurately collecting symptom data. 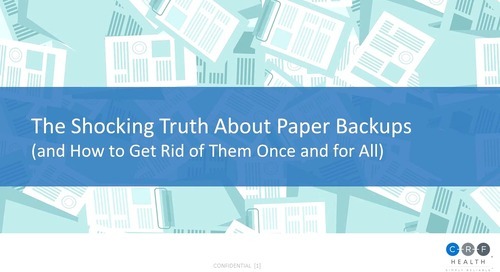 And when I talk about eCOA, I always like to go back to a study that was published by Stone where patients filled in a diary which they had seen was just a paper diary, and reported their compliance at 90%. What they didn’t know was that there was a light sensor in their diaries that would note when they actually opened and reported into their diary. And that revealed that their true compliance was only 11%. In fact, we find that this is quite common with paper diaries. So we see patients suffering from something that we like to call car park syndrome, where they drive to the car park of their site visit, maybe an hour before it starts, and they retrospectively fill in all of their data ahead of that visit, so all the diary data that they were meant to complete in between their last visit and this visit, they just do it all in one go. Often investigators say that they didn’t even bother to change pens and it’s very obvious that patients have just filled it in all at once. So what does that really tell us about the data? Well, if they’re filing it in all at once, that’s introducing a lot of bias. I’m sure we can all relate that, if we’re reporting about whether our symptoms interrupted our sleep three weeks ago or if we’ve had an exacerbation, we’re not going to remember it quite as well as we would have done at the time. In the same manner, if we’re just filling it in in the car park, there’s not been any time for an investigator to review it and kind of think about what the patient has said and focus the conversation when the patient’s at the site. And with site visits not being that frequent, tending only to be monthly, that’s quite important. That time the patient has with the investigator should be focused on what they’ve experienced, should be focused on what they’ve reported. And that’s something that’s just not possible with paper diary. And with all that recall and bias entered, the data quality is reduced because we can’t be sure if what the patient is saying is truly representative of what they’ve experienced. And that’s something that we should avoid. So the next challenge was issues with getting clean physiological data. Protocols can be quite specific about how many readings or when readings should be taken by the patient. And patients sometimes struggle to remember that. With their busy lives and day-to-day activities, it can be difficult to remember, I must take my PEF measurements now, or even if they do take their PEF measurements, particularly with a paper diary, they can forget to write them down or they might forget what time they’ve taken them or what the accurate measurement was. We’re introducing lots of errors by making the patients manually transcribe their readings. They can copy something down wrong or remember the day wrong, or not take as many readings as they should at each day because they’re not reminded to do so. And that means that we’re not getting the data and the values that we need to be able to analyze these down the line. 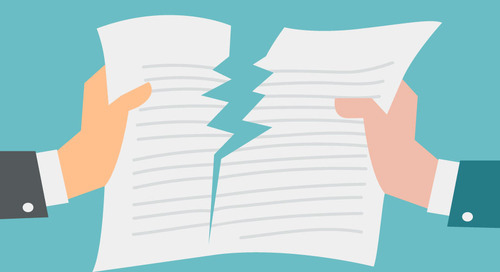 And that’s a really key benefit, I mean, we don’t want to get to a study close and review all the data from this paper diary and see that we don’t have enough information or we don’t have the right data to submit and then have to extend the study. And that’s something that we can track, using eCOA as we go along. Another key thing, and something that’s a bit of a buzzword in the industry at the moment, is patient centricity and patient engagement. And I think one of the key ways of engaging the patient is to give them something back for all the data that they report. Particularly with asthma, more than a lot of other therapeutic areas, we are asking a lot of our patients. They have to fill in their morning/evening diaries twice a day so that’s a lot of data to be reporting, and they have to take the PEF measurements, and it’s a lot of work for them. And it can be a bit demotivating if you feel like you’re reporting all of this data and it’s just a one-way channel and you’re not getting anything back from it, because it’s kind of why a patient is often demotivated by a paper diary, because they can’t see any benefits to the data that they’re putting in, particularly if their symptoms aren’t improving as a result of the study drug. So patients can struggle to be engaged, particularly in between site visits, and that can lead to non-compliance with reporting. And they can also feel isolated between periods, which can even affect their ability to stay in the study. They may think, I’m not improving my condition, I’m not getting any benefit from this data, why am I even in this study. And that’s something you want to avoid. You want to engage and motivate the patients throughout the study so they feel like their data is beneficial not only to the study but to themselves and they get something back from that. And that’s where eCOA can help. So I talked about the problems and I said a lot of “this is where eCOA can help.” But now we’re going to talk about how eCOA can help with these problems. One of the key ways that we can really improve data quality is by having a PEF meter and eDiary integration. So as you can see from our patient in the middle, we can have a Bluetooth integration between the PEF meter and the eDiary, and that means that all the readings from the PEF meter are automatically transferred to the eDiary. So there’s no manual entry of readings for patients, so there’s no errors associated with typing in numbers or not remembering to note something down. Similarly, we can really improve the usability of that by having the eDiary guide patients through how to report their data. So the way that that would work, as you can see on the screen on the right would be that when the eDiary and the PEF meter are paired together, the diary can guide the patient through telling them when to take each measurement and showing the results of those measurements on the eDiaries themselves as well as what their highest measurement was or their best measurement. It can tell them when to blow and it can even guide the patient through how to blow. And that’s something that has been an issue in previous studies, is that patients may not be able to understand how best to use the PEF meter. And that’s something the eDiary can help with. Similarly, we can really use things like training modules to guide patients through how the integration works, how they connect the PEF meter, how they see their readings, so everything is crystal clear for the patient and they feel comfortable with how to use it. A key advantage of this is also with the integration we’re getting date and time stamps for the data, so we’re getting clean physiological data that’s time-stamped and much better when it comes to transferring across for regulators. 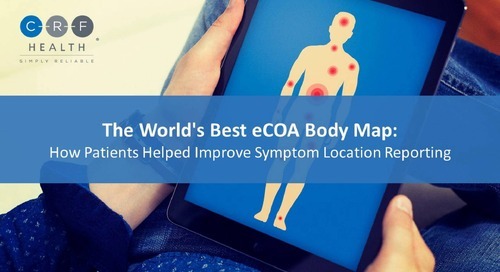 Another thing that eCOA can really do is to improve site and patient communication. 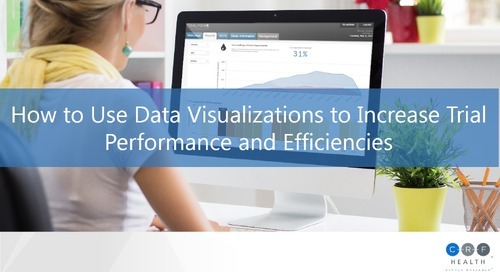 I think that’s one of the key benefits is that sites can really see the data in real time. They can log into a reporting system and see what the patients have reported and they can see if there’s something that’s of concern and contact the patient. Study coordinator can log in and say, oh this patient has not slept for four or five days, let’s give them a call, or this patient has had a lot of high PEF readings or a lot of exacerbations, we should contact them, or this patient seems to be taking a lot of rescue medication, we should check in and make sure they’re okay. 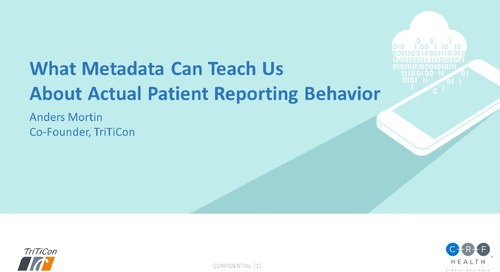 And that way, patients feel like they’re getting something back from their data, not just endlessly reporting. Similarly, if there is certain criteria that’s of concern, perhaps back to back use of rescue medication every day, we can set prompts and alerts to aid that communication. We know that sites are extremely busy and often have more than one study. So we can help them out with getting in touch with the patient. We can send them email alerts like the one that we have on our screen, which will tell them why they need to contact the patient, maybe it’s because they’ve had an exacerbation or they’ve taken excessive use of their rescue medication, or they’ve had really low eDiary compliance recently and they’re not filling in their questionnaires and they’re not reporting their symptoms. And that can all then be followed up. They can easily see which subject it is that they need to contact and then they can go and contact that patient. Similarly if a patient is meeting any of these criteria, the eDiary can notify them that maybe their condition is worsening or that they’ve not been very compliant and suggest that they contact the site. So there’s two way communication. And the patient can immediately see that what they input does have a response through the eDiary itself. And that will really help to keep the patients feeling engaged. And that way, with that real-time data transfer, the sites can look over patient data before they arrive for a site visit, and that can help focus their visit, the patient will come in with having reported all that data, and the site can say oh we looked at this and we noticed that you had this rocky period or we noticed that you’ve increased the amount of rescue medication you’ve taken. We should discuss this and focus that conversation so that they’re making the most of the site visit when the patient is in front of them. 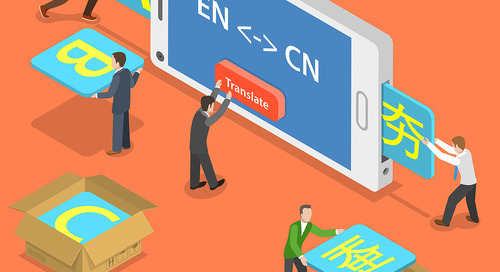 Another really important thing about how easy eCOA is making it user friendly. So I’ve already touched upon how these things like training modules to guide patients through, familiarize them with how to use the eDiary and how to report their data. But also we want to make things less burdensome, that’s the number one thing that everyone on this phone call rated as their biggest challenge, is reducing patient burden. So if we’re going to reduce patient burden then we need to make things easy. With the user friendly eDiary we can implement questionnaires electronically, so we’re reducing completion times by going electronic. We can guide patients through and show them things like progress bars and motivational messages. 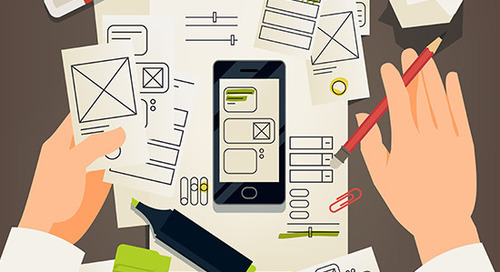 Making them feel engaged makes them more comfortable with the idea of reporting their data, as well as giving them feedback on that data through the prompts and the notifications. And we can also give them things like, for different age groups, we can personally the diaries. So for example, one thing about asthma is that the sufferers have a wide age range—we have paediatric studies, we have elderly studies—and we can tailor the eDiaries to those needs. So if we had a paediatric study, we could have things like icons and screens and messages to get the patient engaged with it and to get the children more interested in reporting their data, because they might not be with just a paper diary handed in front of them. The health benefits may not be clear to them and they may be less likely to report that data. Things like, we can see here, a common questionnaire is the ACQ. And we do have implemented versions of Juniper’s questionnaire and that can help guide patients through reporting in a quick manner and help them to know their routine, they get in a routine of reporting on the eDiary. And that’s a really important thing, is tailoring design to the patients in your study. And one way to do that is to ensure you have the right people doing that design. So having teams like a usability design team that will come in and say, based on our experiences with this patient set, these are the kind of things that you could include. And especially for paediatric studies, based on the ISPOR guidance, we’d need three or four different diaries for the different age ranges, and making sure we have the right language level and the right icons and the right usage that appeal to those age ranges to help improve that. And it’s really important, and another advantage is that we can do usability testing of these electronic diaries. So we can go in and we can test with asthmatic patients to see if they would report their electronic diaries the same as the paper, what their preferences are, what they find easy to use, anything that needs to be tweaking, so before we deploy in the study, we already know that a wide range of asthma patients feel comfortable with reporting their symptoms this way.That way, when the study gets live, we can feel comfortable that with the right training, patients will find it easy to report their data and there won’t be that burden associated with carrying around a paper diary and having to remember to fill it in. Everything is automated on the eDiary. And we’re taking them through and guiding them through that reporting. So those are all the kind of key study challenges and how eCOA can help benefit them. I think the key takeaway messages that we have is that we can really improve symptom data collection, increase PRO compliance, by reducing that patient burden. And the way that we do that is we fit into their lives with tailorable alarms based on their reporting preferences, but ones that also can be changed. So if you’re working 9 till 5 every day and then you think on Saturday, I deserve a lie-in today, patients can configure their alarms so that we’re not interrupting with how they want to live their lives but still getting the data that we need. And with the electronic implementation of questionnaires, we can improve the data accuracy by reducing back filling and forward filling of data. So we don’t just have a patient filling everything in at a site visit, but they also can’t go back and change their answers or skip forward, read the questions, and introduce that bias. And we can also have edit checks where we prevent patients from skipping questions. And data entry windows where we prevent retrospective entry. So we’ve seen in asthma studies that the patients tend to report in their morning and evening diary windows and they don’t report retrospectively. And that’s important because if they’re reporting three days at a time, how can they distinguish which night, which morning was it that I didn’t sleep so well, or which morning was it I had a really bad cough or lots of phlegm, it can be very difficult to distinguish your symptoms if you’re reporting a block. So it’s really important to report that in real time. And completing CROs at home also gives site staff the chance to review scores in between site visits. And that can be especially useful at the beginning of studies when you’re reviewing patients’ eligibility. Yuu can review their compliance and their scores before they even reach the site, and also look at reports to see how they’re performing in their data. So to conclude, I’ve seen quite a lot of questions, so I’ll make sure we get through all of them because we’ve got quite a lot of time. With an increasing amount of data being collected in asthma trials, an intuitive electronic diary really can reduce that patient burden, which leads to high compliance, improved data quality, and study efficiency. And that’s not only a benefit to a patient, but it’s a benefit to all of us on this call, all the stakeholders and all the key players in the industry. With things like symptom notifications and enhancing that communication, asthma solutions can really help site staff to remotely track patients’ conditions, it can focus those site visits, and also see the bigger picture over how a patient’s condition is progressing throughout the trial. And an integrated eDiary really helps to get that clean physiological and symptom data, and helps meet the need of providing the large amount of data required. So before we go to the questions, we just have one last poll. I do want to give you an opportunity to request a follow-up from someone at CRF. 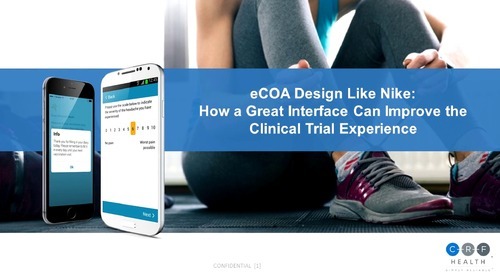 So please, can you vote if you would like us to contact you about using eCOA in your clinical trial. So now, I will open it up to questions. So if you haven’t already submitted your questions, please submit it in the chat window.